In an interesting article in the Fairfax media today, purporting to provide the truth about declining wages in Australia, Jessica Irvine and Adam Gartrell fail to mention that David Ricardo, Adam Smith, JS Mill and Henry George had all said that land rent needs to be taxed away if wages and profits are to receive their fair share of the national cake. 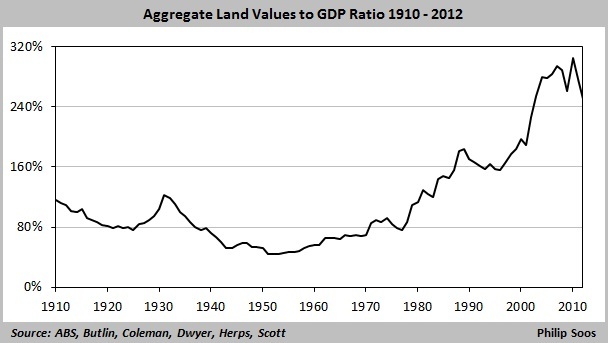 This chart shows the astounding growth in land prices in Australia. It should be seen that land price represents the private capitalisation of land rent, and that if more land rent were captured instead of taxes upon labour and capital, as per the aforementioned gentlemen, wages and profits must increase! Simple – but unfortunately overlooked, guys!